Slemma only shows the values that are represented in your data source. By default, if your data contains zero values for some dimension elements, they are displayed in a chart. If you want to hide such elements, use Show zero values option. 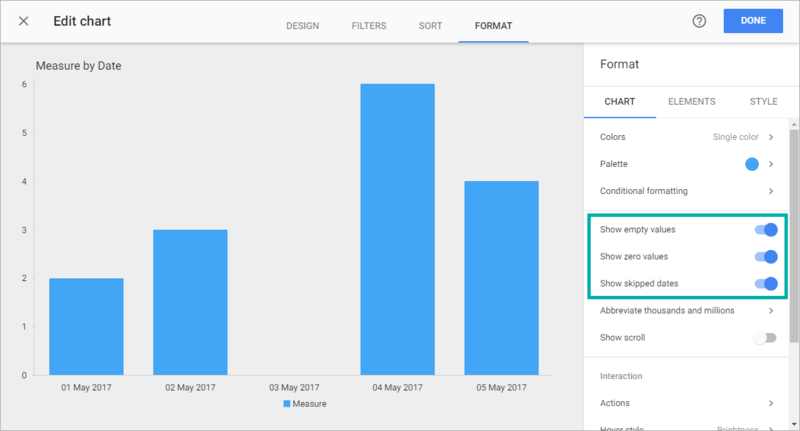 Go to Format > Chart menu and disable Show zero values. You can optionally show such elements to make it clear that there was no data recorded for these elements. To do that, on the Format tab of the chart designer, enable the Show empty values option. Note that Show empty values option disables automatically when adding a filter by measure to a chart. Enable the Show skipped days option to show all the days ( Show empty values option will be enabled automatically). Please note that ‘Show skipped values’ option will show dates between the first and the last points in the chart, not in the calendar. This means that if you have data for the 2nd and the 4th, the 3rd will be shown in the chart, while the 1st will be missing, even if the date filter includes it.